Many ecological processes operate at regional scales, and we have taken an approach that integrates concepts of spatial and temporal scaling to understand climate, land use change, agricultural production, invasive species and carbon sequestration in the USDA’s North Central Region (Grace et al. 2006b, Isard and Gage 2001, Isard et al. 2005, Nessledge et al. 2006). We have also examined land use change in Michigan and the role that fragmentation plays in affecting ecological services (Skole et al. 2002, Friedman et al. 2007). 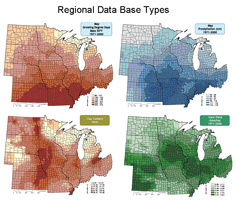 Regional analysis and modeling requires regional databases. We have assembled a database for the NCR that includes physical, biological and socioeconomic variables. Each of the data sets is linked to the 1055 counties in the North Central Region and the temporal record begins in 1970. The climate data are daily; the crop production and socio-economic data are based on annual assessments; and the physical data (soils, topography, etc.) are relatively static. These data (Gage et al. 2003) provide a framework for analysis of regional climate impacts on crop productivity (Gage 2003) and for evaluation of future crop production uses. 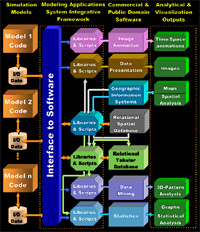 We developed a Modeling Application System Integrative Framework (MASIF; Gage et al. 2001) to accommodate the large amounts of spatial-temporal inputs and outputs to and from regional scale analysis and simulation environments. This provides an analyst with the ability to rapidly assess regional scale model performance and attributes. MASIF enables visualization of model input data, model simulation results, and statistical patterns of information associated with model inputs and outputs. Investigations of GRID technologies to manage and access large datasets have been developed to address future cyberinfrastructure needs by LTER and other investigators involved in regional collaborations (Butler et al. 2006). We have conducted analyses of historical maize productivity patterns in the NCR and have explored future scenarios of crop productivity and climate impacts. We have integrated a physiological corn model into the MASIF interface to facilitate data management and visualization of model inputs/outputs and use of GIS and statistical analysis. The types of outputs from each crop simulation include daily leaf emergence, leaf elongation, leaf area index, leaf biomass, photosynthetic and transpiration rates, and seed growth. Large digital input and output streams from each model run produce about 4 million records of point-based simulation results. 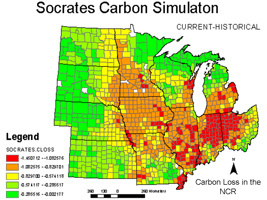 We have used the SOCRATES soil carbon model (Grace et al. 2006a) to simulate soil organic carbon (SOC) dynamics across the NCR (Grace et al. 2006b). Litter inputs were estimated from net primary production (NPP) determined by the Miami model. We generated pre-settlement (1850), current (1990) and future (2100) soil carbon surfaces, with the latter under both conventional and no-till scenarios. Carbon emissions from agricultural machinery and inputs of 149 and 126 kg C/ha/yr for conventional and no-tillage systems respectively, as well as methane consumption of 2 kg C/ha/yr and nitrous oxide production, were included in net carbon sequestration maps from 1990 through 2100. To better understand the dynamics of landscape change we conducted a statewide landscape fragmentation analysis (Friedman et al. 2007). Land use and land cover was assessed using satellite imagery to determine fragmentation conditions to assist land use developers, planners and decision makers. Fragmentation patterns (number of classes, number of patches, patch density, percent of the dominant class, weighted mean perimeter area ratio, and contagion) for eight land use land cover classes (agriculture, built, barren, forest, urban vegetation, other vegetation, wetlands and open water) were calculated. Butler, R. M. Servilla, S. Gage, J. Basney, V. Welch, B. Baker, T. Fleury, P. Duda, D. Gehrig, M. Bletzinger, J. Tao, D.M. Freemon. 2006. CyberInfrastructure for the analysis of ecological acoustic sensor data: a use case study in grid deployment. Challenges of Large Applications in Distributed Environments, 2006 IEEE 25-33. Friedman, S.K., M. Colunga and S.H. Gage. 2007. Quantitative Landscape Fragmentation Characteristics of Michigan. Land Policy Institute. Report #2007-10. 80 pp. Gage, S.H., and Members of the NC1018 USDA Regional Committee. 2003. Atlas of physical, biological and socioeconomic patterns in the North Central Region. Gage, S. H. 2003. Climate variability in the North Central Region: Characterizing drought severity patterns. In Climate Variability and Ecosystem Response at Long Term Ecological Research Sites. D. Greenland, D. Goodin. and R. Smith Eds. Oxford Univ. Press. Gage, S. H., J. Gosz, and W. Michener. 2002. Site to regional scaling. Pages 37-41 in Scaleable Information Networks for the Environment. Withey, A., Michener, W. and Tooby, P. Eds. San Diego Supercomputer Center, San Diego, CA. Gage, S. H.., S. A. Isard and M. Colunga. 1999. Ecological scaling of aerobiological process. Agricultural and Forest Meteorology 97:249-261. Grace, P.R., J.N. Ladd, G.P. Robertson and S.H. Gage. 2006a. SOCRATES-A simple model for predicting long-term changes in soil organic carbon in terrestrial ecosystems. Soil Biology and Biochemistry 38:1172-1176. Grace P.R., M. Colunga-Garcia, S.H. Gage, G.R. Safir and G.P. Robertson. 2006b. 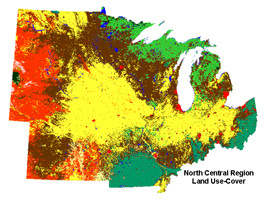 The potential impact of agriculture management and climate change on soil organic carbon of the North Central Region of the United States. Ecosystems 9:1-13. Isard, S. A., Gage, S.H., Comtois, P. and Russo, J. 2005. Principles of the atmospheric pathway for Invasive species applied to soybean rust. BioScience 55:851-861. Isard, S. A. and S. H. Gage. 2001. Flow of Life in the Atmosphere: An Airscape Approach to Understanding Invasive Organisms. Michigan State University Press. Skole, D.L., S. Batzli, S. H. Gage, B. Pijanowski, W. Chomentowski, W.R. Rustem. 2002. 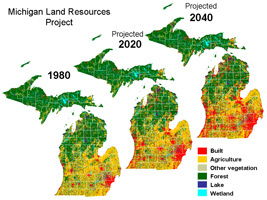 Forecast Michigan: Tracking change for land use policy and decision making. Institute for Public Policy and Social Research. Michigan State University. Nessledge, G.M., B.A. Maurer and S.H. Gage. 2006. Gypsy moth response to landscape structure differs from neutral model predictions: implications for invasion monitoring. Bio Invasions 9:585-595.